Livliga® Live Vibrant Blog: Can I Really Feel Fuller Because of the Size and Shape of My Plate? Can I Really Feel Fuller Because of the Size and Shape of My Plate? Simple answer? Yes, absolutely. In recent years a number of studies have been done around the size and shape of the dishware we use and how it influences how much we eat and our sense of satisfaction. It is hard to believe that something so basic can have a quantifiable effect on our eating habits. Remember the phrase- “Your eyes are bigger than your stomach?” It is true. Our eyes are what make all the decisions about the food we eat, not our stomachs. Our eyes measure relatively so depending on the size and shape of our dishes depends on how much we end up serving ourselves. Our eyes need for our food to look like enough and we will serve up quantities of food according to that perception. For starters, the size of our plates has grown by over 51% in the past 30 plus years from 9.5 inches to nearly 12 inches. Why is this important? The bigger the plate the more food we can put on it. And we do. Another reality is that the most popular plate for people to buy today is the coupe plate. This is a plate with no rim. Not only are our plates bigger but we have also gotten rid of the rim. This means we can put even more food on our plates. And our eyes direct us to do so. The shape of our dishware is also important. Studies show us that the shape of our plates and other dishware can also influence how we perceive the amounts of food on and in our dishes. A good example of this is the shape of our mugs and glassware. If they are short and squat we will end up pouring more into them because amounts look like less in them. On the other hand, in a tall, more cylindrical vessel, what we pour will look like more. 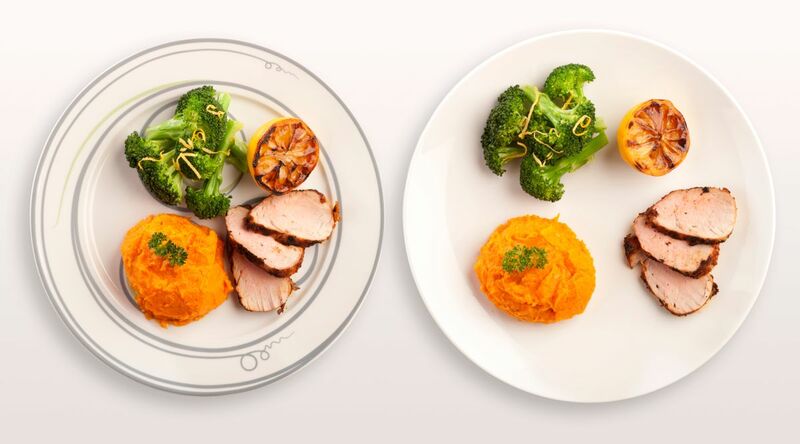 Have you ever been on a diet and served up a right-sized meal on your modern dinner plate? It looks puny, doesn’t it? Before you even start eating, your eyes have told your brain that what you are going to eat doesn’t look like enough so your brain is already sending the message to your stomach that you won’t feel full once you’ve eaten it. Nineteenth century scientists, Delboeuf and Ebbinghaus have shown us how visual illusion can be used for our benefit when it comes to seeing right-sized amounts of food as plentiful. Delboeuf, for instance, showed us that by putting a circle around a smaller circle we can make that inner, smaller circle look larger. 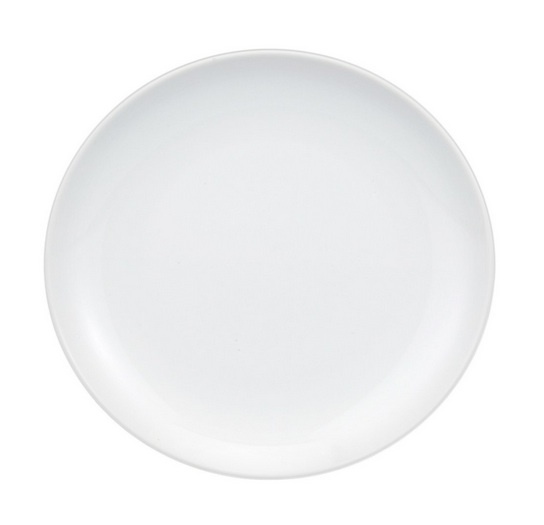 That is why choosing a plate with a rim can help you serve up right-sized amounts of food and have it look plentiful. There are other elements that can positively influence your sense of satisfaction at a meal. Color can have a profound effect on your mood. Hot colors like red, orange and yellow, like you see in fast food restaurants, are stimulating so you end up eating faster and most likely, more. It is better to choose calming colors; the best color is blue since it has been shown to be an appetite suppressing color. Attractiveness is also key for our sense of satisfaction. Just think about when you have an important meeting or are looking forward to seeing someone. You think about what you are going to wear and how you want to look, right? Why do we do this? Because of the way it makes us feel. Feeling great empowers us. And when it comes to eating, the better we feel the more in control we are. The more in control we are the better decisions we are able to make when it comes to the food we eat. So as you can see, the size and shape of your plates does make a difference in helping you right-size your eyes and your serving sizes. For best results you need to use a dinner plate that is no larger than 10.5 inches and has a wide rim. 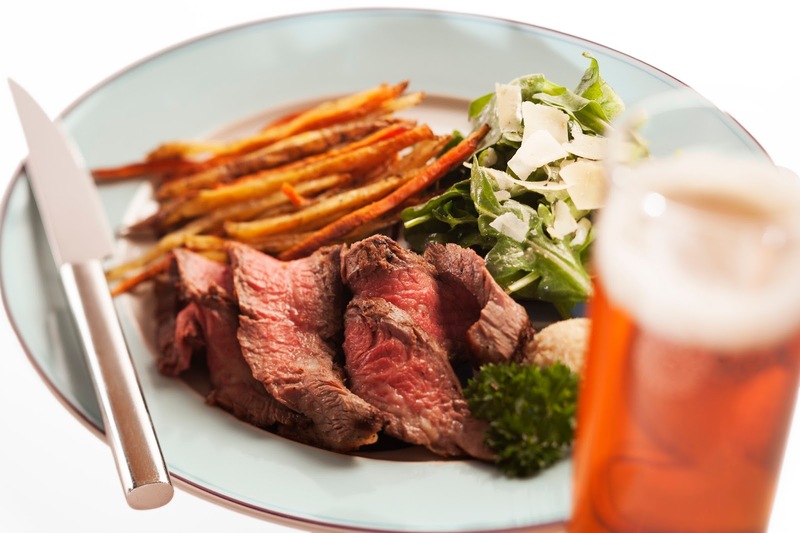 Every piece of dishware and glassware needs to be right-sized and shaped such that standard servings look plentiful. The design and colors you choose will also have an effect. If you are interested in finding out more or learn what choices are available, check out Livliga as a helpful resource. You deserve to eat off of attractive, beautifully designed and right-sized dishware. Investing in your wellbeing and health is the best investment any of us can make for long-term success. This blog was originally published on the dLife website. Since its inception in 2004, dLife has become the premiere platform to inform, inspire, and connect with millions of diabetes patients, consumers, and caregivers and in the process positively impact engagement and ultimately health outcome.